Author George R. R. Martin, whose books inspired the hit television series “Game of Thrones,” poses during a photo shoot on Nov. 10, 2013, in Sydney, Australia. “A Game Of Thrones” author George R. R. Martin at the Third Annual KINGS OF CON party, on July 18, 2013, in San Diego, California. HBO wrapped up its fourth season of the smash hit “Game of Thrones” on Sunday. The show is based on the bestselling “A Song of Ice And Fire” series, written by George R. R. Martin, who’s completed five of the series’ seven books. When the remaining two books will come out is a major source of stress and enthusiasm for fans, as well as a constant subject of speculation. Martin’s novels can approach over 400,000 words and 1,000 pages in length — these are no small undertakings. And after he spent the first decade of the 2000s struggling to produce the most recent two books in the series, some fans have wrestled with the idea that Martin may not be able to finish writing the next two before he’s overtaken by the hit HBO show. As a result, “Martinology” — the pseudoscientific process by which fans attempt to predict the release date for the forthcoming “The Winds of Winter” (“TWOW”), the sixth book in the series — has never been a more popular avenue of amateur study. A vast number of predicted release dates already have flown aerodynamically by. But there are a handful of entirely reasonable approaches some fans have used to infer when “TWOW” will come out. In August 2013, one reader used back-of-the-envelope math to estimate an April 2014 release date for “TWOW,” based on assumptions about Martin’s progress, the rate at which he writes and the expected length of the book. Perhaps the most encouraging analysis comes from another reader, who did some sleuthing and deduced from a gap between August 2014 and May 2015 in Martin’s rarely empty appearance schedule that the writer may have some plans to publish in the spring or summer of 2015. This seven-month gap is consistent with another in Martin’s schedule from November 2010 to June 2011, when the fifth book in the series, “A Dance With Dragons,” was formally announced. Indeed, fans have also observed from Martin’s LiveJournal blog that the writer has been spending the past several months camped out at his home in Santa Fe, New Mexico, the only place where he is known to write. So there’s a lot of speculation, but not many of these predictions are based on data. Can we use data to figure out how old George is doing? It can’t hurt to try. So here’s my stab at the prediction game. 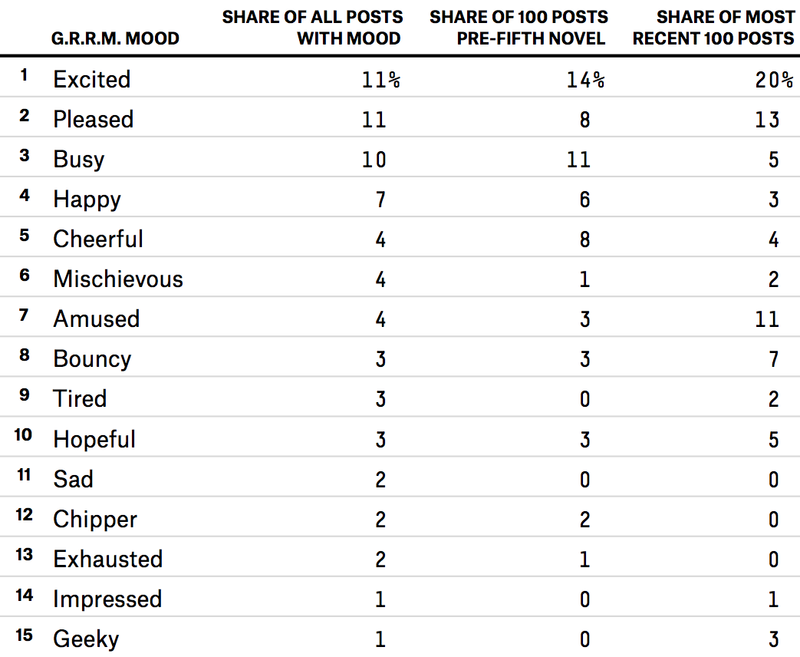 We have quite a bit of data on Martin’s moods over the past decade or so, as he tells fans how he’s feeling at the bottom of each post in his regularly updated LiveJournal. And any dedicated reader of Martin’s blog knows that each year from August to December the man transforms from the nation’s preeminent living fantasy writer into that uncle at Thanksgiving who has everything riding on the performance of a football team. Or two teams in the case of this Bayonne, New Jersey, native: the New York Jets and the New York Giants. He even lost a bet and wrote a coded reference to the New York Giants beating the Dallas Cowboys into his fifth book in the series, as an Easter egg. I decided to read the tea leaves by pulling Martin’s stated moods, as well as the performance of these two football teams, to see if there was any correlation between his publication rate and how he’s feeling, or how Big Blue and Gang Green are doing on the gridiron. As for his progress on the forthcoming book in the series, according to sources compiled by a fan community, Martin anticipates “TWOW” will be about 1,500 manuscript pages.2 In October 2012, Martin told a reporter that he had written about 400 pages, but he hasn’t commented on his progress since. Martin’s NotABlog is a constant source of attention from fans. It’s where he announced the completion of “A Dance With Dragons,” the green light for the HBO series and all sorts of other projects. As a fan, the fact that Martin is often “busy” is encouraging. But (and this is a big but) the lower busyness rate recently — 5 percent as opposed to his usual 10 percent, or his 11 percent right before the publication of his last book — is disconcerting. The optimist in me says that means the stuff he’s doing these days feels less like a chore. Towards the tail end of his last book, “A Dance With Dragons,” which was the culmination of a 10-year struggle to get words on paper, he was regularly “busy” but less often “pleased” or “happy.” He regularly referred to the book as “Kong,” a gigantic monster that had upended everything in his life. When he announced its completion, he said that he had killed Kong. Maybe “TWOW” isn’t another Kong. Fans have speculated that Martin bit off more than he could chew with his many projects. Over the past several months, he has scaled back his commitments. Maybe that’s why he’s less busy? The pessimist in me, on the other hand, wonders whether he’s just not spending much time on the book. There are no deep insights here into the timing of the “The Winds of Winter,” but it’s always nice to know that your favorite author is doing well, right? For the books where Martin had a cohesive plan in place — “A Clash of Kings” and “A Storm of Swords” — he wrote 392 final words per day and 673 final words per day, respectively. 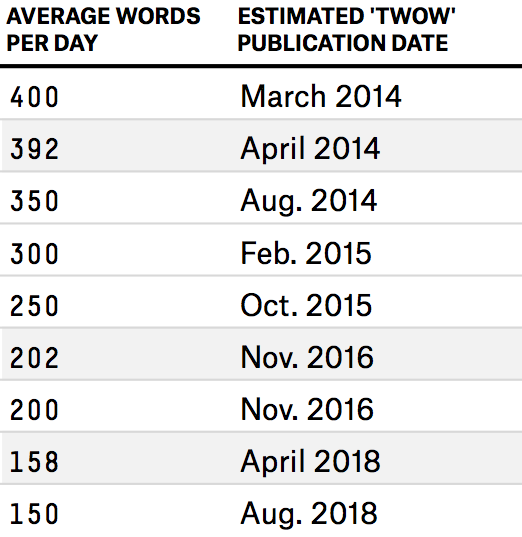 For books where he was building his world or untangling a hump in writing — “A Game of Thrones,” “A Feast For Crows” and “A Dance With Dragons” — he wrote at a substantially slower pace, at 145, 158 and 201 final words per day each. So if you’re an exceedingly superstitious fan of the “A Song of Ice And Fire” books, it can’t hurt to root for Gang Green this time around. If anything, this has been an exercise in the limits of statistical analysis. Understanding what data can and cannot do is just as crucial as being literate in the stats. Sure, we can make inferences, but the only thing this really comes down to is a genial man in Santa Fe, a harried editor in New York and a legion of international fans salivating so hard they’re beginning to dehydrate. When will George R. R. Martin come out with the next book? I have no idea. The stats tell us essentially nothing. The good news for fans is that he’s in Santa Fe with a pretty clear schedule. The worst news is that my most promising finding is that he’s excited. As always, when will George R.R. Martin release “The Winds of Winter”? Whenever he damn well pleases. Martin started “A Game Of Thrones” in 1991, publishing the first novel in 1996. “A Clash of Kings” followed in 1998, then “A Storm of Swords” in 2000. While the next installment was expected to be a single volume, Martin struggled with writing it. In addition to canceling a flash-forward — his original intention was to jump five years into the future — he also had to contend with an event termed the “Meereenese knot,” when several point-of-view characters descended on a single location. This proved difficult to orchestrate, and the final result was the volume being split in half, with “A Feast For Crows” being released in 2005 and “A Dance With Dragons” in 2011, more than 10 years after “A Storm of Swords.” The delays meant that Martin lost his substantial lead on the “Game of Thrones” television series, which premiered in 2011, four months before the release of “A Dance With Dragons.” In the interim, Martin has been working on the next installment in the series, “The Winds Of Winter,” but has been substantially more private about his progress. Word counts of Martin’s previous books in the table above come from Fantasy-Faction. His first recorded mood was in a June 2007 entry. Did you know? Martin owns two homes on the same street, one of which is used exclusively to store his collectibles and figurines. 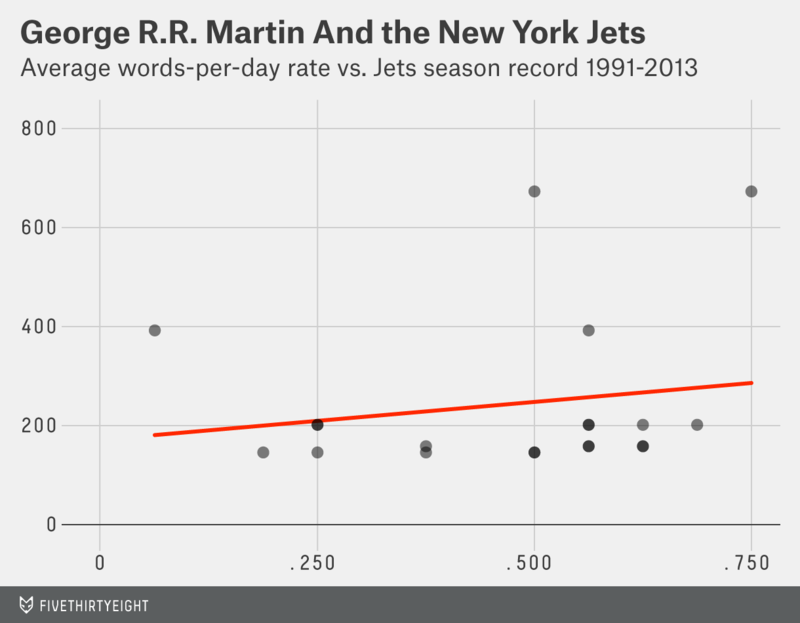 I estimated the rate that Martin wrote each book based on final words per day. Martin wrote manuscripts, not books, and so this is just a proxy for the man’s writing rate after the fact. Indeed, based on reported manuscript page lengths and actual book page lengths, only about two-thirds of the material Martin writes in his manuscripts makes it into the final books. Given the historical ratio of manuscript pages delivered to final pages printed, his estimate of 1,500 manuscript pages for “The Winds of Winter” means about 980 final pages. With the previous two books clocking in at about 400 words per page, that’s 392,000 words. The date range is from the publication date of the previous book to the publication date of the book in question — again, not perfect, but an estimate.